Konkere Beats - Soul Jazz Records Presents YORUBA! Songs and Rhythms for the Yoruba Gods in Nigeria. Vinyl LP, CD. Bleep. The legendary Soul Jazz crew assemble a collection of frenzied percussion tracks from the new school of Nigerian musicians. Recorded in Lagos especially for the label, these show the wide breadth of drumming techniques to originate from the country. 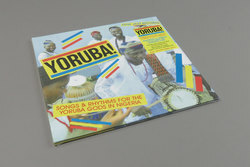 As the 40-page booklet details, the Yoruba tradition has spread its influence all across the world since the global slave trade. You will hear it in contemporary dancehall, house and Candomble as well as Latin music of years gone by. Soul Jazz offer up a contemporary reflection on the techniques from some local master drummers – not one to miss!